When you want a lush, green lawn, and you need it now, the answer is sod installation. Yet installing sod is not as simple as unrolling it, watering it and watching it grow. You need the help of a professional to ensure that the sod is laid perfectly, so it will grow and thrive. At Vision Green, we are pleased to offer sod installation in Charlotte, so your home or business can enjoy a lush, green lawn quickly and with minimal hassle. If you have ever tried to plant a lawn, then you understand the challenges that this process brings. First, you have to prepare the soil. Then, you have to lay the seed, keeping it well watered while it germinates. Of course, when the tiny little sprouts of lawn start to show, you have to be worried about weeds that can sprout up in your carefully prepared soil and destroy your lawn. 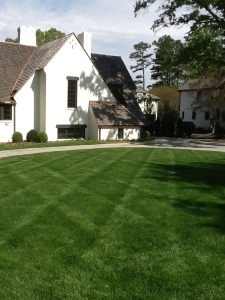 Sod installation in Charlotte eliminates this stress and hassle. The Vision Green team will choose fresh, healthy sod that is the right type for your lawn, prepare the soil underneath, install it and prepare you to care for it. Your yard can go from dirt to beautiful grass in one day, without the tremendous effort required to plant, protect and water grass seed. Remember, not all sod is created equal. If you want a breathtaking lawn with the benefit of sod, choose Vision Green for sod installation in Charlotte. We will choose the industry’s best, certified sod that is free of weeds, fungus and disease, so your lawn will grow and thrive. Contact Vision Green today to make your vision for your lawn a reality with the help of our landscape designers and lawn specialists.